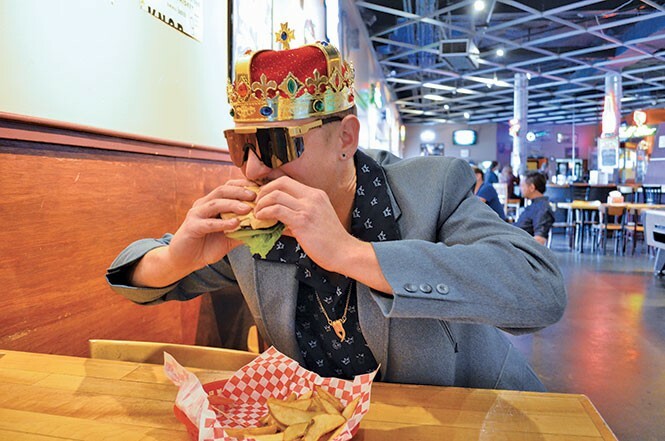 Back in spring, City Weekly ran a competition called "Burger Week," calling all burger enthusiasts to try as many of the 38 participating local restaurants as they could. Only one person was able to eat at all of them—a man by the name of John Gutz, who found out about the event while browsing through the paper at his work, Brewvies Cinema Pub. Gutz was the grand-prize winner of a new grill, bike and cooler donated by Budweiser. Despite eating a burger for every meal of the day, Gutz enjoyed the contest because it introduced him to new favorites. How did you hear about the contest, and what made you decide to do it? I just saw it in the City Weekly and me and my friends were talking about it. I'm into contests, so I just said 'I'm going to give it a shot' and started for the lower prizes. Once I started getting into it more and more, it all sort of steamrolled from there. You ate at every single burger joint in the competition. Do you remember your first and your last burger? My first one, I went up to Habit and got a bag of burgers for me and my buddies and those were really good. My last one was over at Squatters, I know that one. That was a late night, mad rush to get all the final burgers in. I actually remember all the restaurants I went to and all the types of burgers I got from each. To eat at all 38 restaurants, you had to average around three burgers every day in the two-week competition. What was your strategy? I got a lot of them to-go and would eat them at home. I would wake up, go have one for breakfast, pick another one up to-go for lunch, then go out and have a burger for dinner so that would be my three. I had plenty of burgers for breakfast. But there were some days I had to cover like six per day to catch up and go to all of the places. Did your health suffer at all in those two weeks? I actually probably ate better then than I normally eat, so I felt pretty good. I was sweating burgers there for a while, but there were no adverse effects. My favorite burger was surprisingly the Athenian from Apollo Burger. And I also really liked the chubby from Copper Creek out on 5600 West. The Athenian was awesome, it was fresh and had roasted peppers, some feta. I went in there thinking it would only be an average one, but when it was all said and done, it wound up probably being my favorite. What did you enjoy most about the contest? Winning the grill, bike and cooler for one. Also, just being able to get out and try places I had never thought of going to before. It felt good supporting local businesses and going around the city and finding new places I'd never think of going to before. I'd definitely do the competition again. Some places I'd never even heard of either. Britton's and Copper Creek, I had never heard of those before, but their burgers ended up as my top three burgers and it was nice to add those places to my radar. I would recommend everyone participate next year, there's a whole bunch of places that I would totally go to again because of the competition.